Great shooting performances sometimes have more to do with luck than actual skill or great basketball, but the Brooklyn Nets dominated thanks to the 3-point shot by playing smart basketball and moving the ball quickly, resulting in a 104-90 win over the Miami Heat to claim their first victory in the conference semifinals thanks to some great shooting from Joe Johnson and despite a good game from LeBron James. And maybe that is what it comes down to: Who makes or doesn’t make 3-point shots. The Heat weren’t that bad; 8-of-24 is something you can live with, but the Nets shots 15-of-25 (60%), and got Miami to try and live and die on James’ scoring ability instead of making it a team game. If Brooklyn can keep their defense this disciplined which means James is the one who has to work hard instead of his teammates, this series is far from over. James started out hot with 16 points in the first quarter but finished with 28 overall. The Nets were using every trick in the book to slow him down which included flagrant fouls (which didn’t stop him early on) but eventually they got what they wanted. James wasn’t completely unstoppable, and no one else on the team stepped up to make a difference. Dwyane Wade scored 20 points, but Chris Bosh had only 12, Mario Chalmers scored 3 points and Ray Allen had nine off the bench without a 3-pointer. The Nets had plenty to be happy about. Their defense didn’t look slow and overwhelmed by the physical Heat; they kept Miami on only five offensive rebounds, without the long possessions of the previous game and even though Deron Williams continues to struggle with his shot, finishing with 3-of-11 from the field to score 9 points, it was his decision making at point guard (11 assists) that made it seem so easy down the stretch. The Nets got plenty of opportunities in transition, something that didn’t happen often enough in the previous games. They “settled” for threes, but when they’re completely open, they’re not bad shots. Joe Johnson led the charge with 19 points (5-of-7 from beyond the arc) and Paul Pierce added some firepower of his own with 14 points, not letting James’ dominance over him on one side of the floor bother him too much. Mirza Teletovic was the only one hitting 3’s with hands in his face, scoring 12 points, all of them from beyond the arc. Kevin Garnett also makes a difference. He can’t stay on the floor for too long (23 minutes this time) but he didn’t look like a scrub in those minutes, which is something considering how badly he played through the first two games. Whenever Garnett plays well it doesn’t mean a shut down defense, but it energizes the rest of the players to a level of much better defense, which is something the Nets can’t afford to let go of. Some losses for the Heat feel like they’re acceptable. 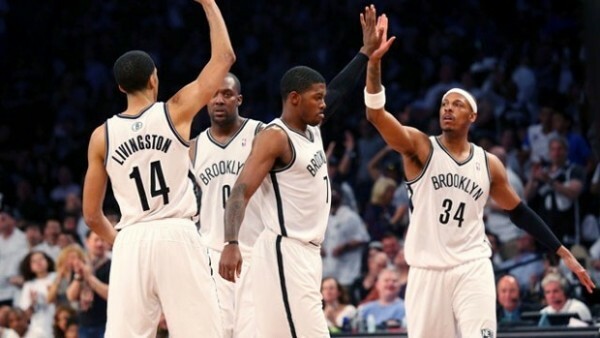 The Nets have their backs to the wall, no matter what. They’ll need this kind of consistent effort on both ends of the floor to turn this series around, but if they can continue to make the Heat neglect other weapons and try too much with LeBron James, this series might go on a bit longer than it seemed like initially.